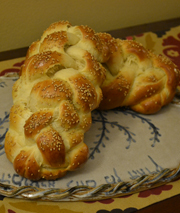 It's Passover here at the Challah Blog Bayit, so no luscious, sweet braided hametz for us! 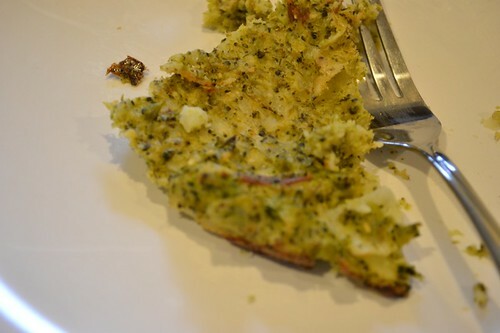 Instead, I bring you a tossed together Broccoli Potato Kugel, which we basically made because we had a bunch of broccoli in the house! I wasn't incredibly careful when I was doing this method, but here's what I did... Chop the Broccoli into small pieces (not too small to be manageable). Boil or steam until soft (I used the microwave). Blend in food processor or mash with a fork (this was quite a feat because our Passover Food Processor is only a 3 cupper... I had to do several loads). 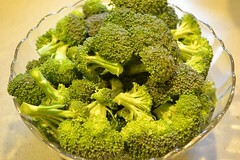 Mix broccoli with beaten eggs. Cut potatoes in chunks leaving skins on. Boil until soft and roughly mix with margarine. While potatoes are boiling, you can saute the onion (you could probably skip this step). 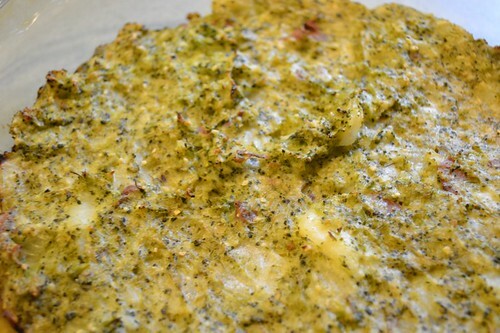 Mix the whole shebang together, adding the mayo, matzah meal, salt, pepper, and garlic powder. Put in you desired kugel pan. I actually used an 8x8 and then added the leftover into a glass pie pan so I could sample this. Bake at 375 for 30-45 minutes until top is browned (my oven is terrible, and I never know if the temperature is really accurate). My plan is to reheat and serve during 7th day for lunch! Yum. I kid (get it?) you not, I had to cut 3 pieces before I actually managed to take a sample photo because I kept getting distracted and eating my model piece!